Halloween offers a plethora of creative food ideas - it's super easy to make pumpkin, spider and witch cookies or cakes. But if you want to really stand out at your next Halloween party, make jello shots and watch Adult face light up! Because it is Halloween, these shots need to be a little spooky, weird really, AND they have to taste good. I came up with a number of ideas, bounced them off of Dave and together we refined the ideas to two. From there it was just a matter of how to execute. Making a clear gelatin with a floating heart was the most fun. I never use actual box Jell-O in my shots, as much prefer to create my own flavors and control the sweetness. The names of these spooky gelatin shots help to set the tone, make a fun sign so everyone understands what they are. The party I attended was quite dark, so vulnerable guest had no idea there was a 'heart' in the middle of one of the shots...I couldn't have planned that better. It really freaked people out - an unexpected, Fat and Happy Halloween spook! Tips and Techniques: Each recipe below makes about 15 - 20 jello shots. 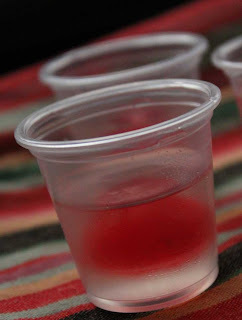 You can pick up the jello shot cups at most liquor stores. 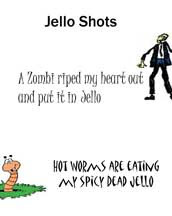 Click to see my other tasty jello shot recipes. Stir and strain into a pouring device. Pour into plastic shot cups*. Add a liquor soaked cherry. Chill. *worth the extra step: If you want the 'hearts' to appear like they are floating, fill each cup to a quarter a half of the cup and then place in the fridge. 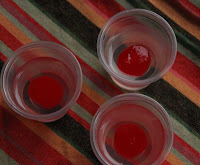 Once that sets firm, add a soaked cherry and top with the rest of the jello liquid. Stir and strain into a pouring device. Pour into plastic shot cups (if you don't have the little plastic cups, pour into a pan and you can cut this into squares after it sets.) 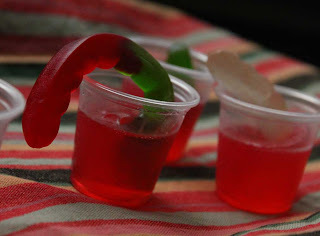 Let the shots set slightly in the refrigerator, and then add a gummy worm to each. Saw this too late to make for tonight's party! Those worms look fun!